Could you tell me what is causing this and what could done to prevent it. Thank you, Derrick"
One possible cause of the burned leaf tips on your Prayer Plant could be chlorine or flouride in your water supply. This problem can be alleviated by using bottled water, or allowing the water to sit in an open container for 24 hours before using it. Unfortunately, the Prayer Plant is only hardy in USDA zones 11-12. Prayer plants need very high humidity to thrive. They grow best in a warm greenhouse or a terrarium. Provide medium or bright filtered light, but never direct sun. Plant your Prayer Plant in a well drained soil to which a little peat moss has been added, because they need a slightly acid soil. Keep the soil evenly moist but never soggy except when Prayer plants are resting in winter, when you should keep the soil drier. 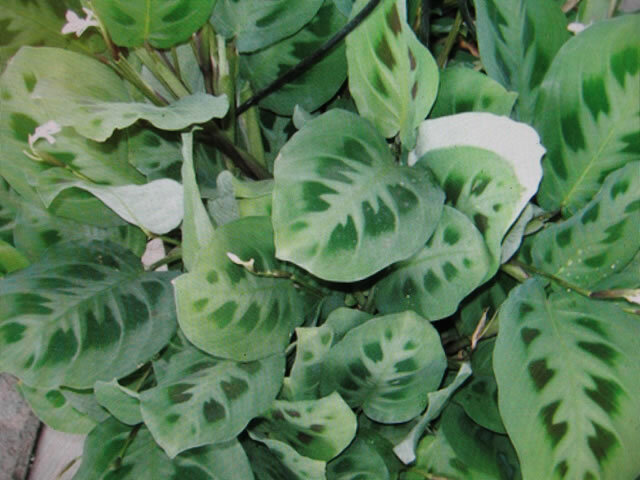 Feed your Prayer Plant a balanced acid type fertilizer like Miracid® every 2 weeks when actively growing. at which time you can propagate new plants by division. The ideal temperature range for growing Prayer Plants is between 60° and 85°. Dry air may be a problem in the winter, and this is often the cause of brown leaf tips. Putting the Prayer Plant in among several other house plants will help to create a more humid atmosphere. Another aid for humidity would be to place a bowl of water in the immediate vicinity of the plant or place the pot on top of a saucer filled with moist pebbles.